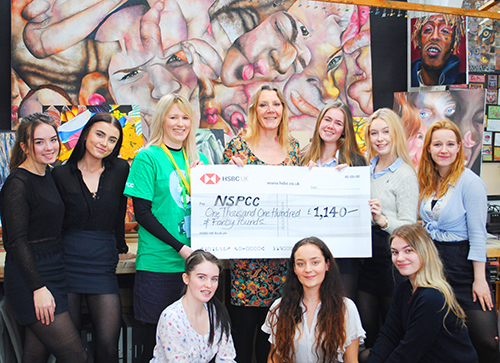 An amazing art exhibition showcasing the wonderful artistic talent of pupils at Bradford Grammar School (BGS) has raised an incredible £1,140 for the NSPCC. Speak out. Stay safe. is an innovative NSPCC programme delivering safeguarding messages to primary school children. We know that the best way to reach children is through speaking to them directly in schools and our ambition is to visit every primary in the UK at least every 3 years. In Bradford in the 2018/19 autumn school term alone the NSPCC spoke to 7,952 children and visited 25 schools to deliver our Schools Service programme, teaching children how to keep themselves safe from abuse and neglect. For each of the primary schools we visit NSPCC volunteers present two slightly different assemblies – one for the younger children in Key Stage One, and another for the older Key Stage Two pupils. The aim is to help children understand about different types of abuse and neglect so that they can get help if or when they need it. The assembly helps children to identify a trusted adult they can speak to if they are ever worried about themselves or a friend along with information about Childline. Michelle Poucher, local schools service coordinator for the NSPCC said “Children who suffer abuse often don’t recognise what is happening to them is wrong so it is hugely important we reach as many children as possible to help protect them from all forms of abuse. BGS Head of Art, Josie Barraclough said: “We get a real sense of reward watching students grow over a period of time because you see how their art work progresses, how they participate and how they’ve improved. I think contributing to the arts as a young person is important. It aids in their personal development and wellbeing, because it gives them a chance to evaluate themselves, their work and to come out of their comfort zone. If you would like to volunteer for the NSPCC school service and help us deliver our Speak out. Stay safe assembly please visit volunteer for the school service. “We get a real sense of reward watching students grow over a period of time because you see how their art work progresses, how they participate and how they’ve improved. I think contributing to the arts as a young person is important.